Swiss banks have been doing an extremely brisk yet totally discreet trade with their "New Safe Haven" solution ever since the Eurozone crisis went into full swing and new bilateral tax-treaties were inked with major countries to prevent secret bank accounts in Switzerland being used for evading taxes. Those two drivers together may have inadvertently contributed to a powerful "New Safe Haven" solution. With rising fear amongst global investors and savers that loose monetary policy by central banks will stoke inflation coupled with a global crackdown against alleged "black money" in secret Swiss bank accounts; Swiss bankers have been quietly selling their "New Safe Haven" solution to their rich clients around the world. Investors in search of extra security are discreetly invited to store large quantities of high-value 1,000-Swiss-francs bank notes in safe deposit boxes. Just one 1,000-Swiss-francs banknote is worth more than 1,000 US dollars, making it easier to store large amounts of cash money in the form of those high denomination banknotes. Switzerland, known for its financial stability, is amongst the few major countries to have its highest banknote denomination set at 1,000-Swiss-francs while the highest value banknotes in the UK and the US are only 50 pounds sterling and 100 dollars respectively. The US used to have high-value notes like $500, $1,000, $5,000 and $10,000 earlier, but those currency bills were printed for the last time in 1945 and are no longer in circulation since 1969 because of concerns about counterfeiting and the use of high denomination cash notes in unlawful activities such as the illegal drugs trade and organised crime. As the global pressure mounts on Switzerland to give transparent access to relevant client bank account details to powerful countries, the demand is growing for 1,000-Swiss-francs notes as those high-value currency bills make it easier to store large amounts of cash undetected and below the national tax-authorities' radars. Safe deposit boxes, kept inside the premises of Swiss banks, are also reportedly being used to stash gold, diamonds and rare fine art including paintings and sculpture, amongst other valuables. Via the safe deposit box system there is limited risk of being caught by the preying eyes of major countries armed with nascent banking information exchange treaties with Switzerland. According to industry sources, Swiss bankers are quietly telling their rich clients that Switzerland's tax and information exchange pacts with major countries are mostly limited to funds in customers' savings, deposit and investment accounts, and do not apply to the safe deposit boxes because their contents are not considered bankable assets. As a result, the demand has now soared to record high levels for the safe deposit boxes and the 1,000-Swiss-francs banknotes in Switzerland, as the world's rich are rushing to park their wealth in this "New Safe Haven." As per the latest data available from Switzerland's central bank SNB -- Swiss National Bank -- the 1,000-Swiss-francs banknotes now account for 60% of the total value of all Swiss bank notes in circulation, up from about 50% a year ago. Most Swiss banks have a vault room where individual clients can rent out a strong box to deposit precious items and documents. To ensure the system’s security, two different keys must be used at the same time to open the box. One is the banker’s key and the other belongs to the client. This means the banker will be there when the client opens the box. To make sure the client’s privacy is preserved, there is a removable metal box inside the strong box. The client takes this removable box to a private booth where he can do what he wants with the contents in the fullest privacy. Small boxes can contain such items as gold coins and gold bars, jewels, bonds and shares, contracts, official documents or even compromising letters. Larger boxes can be used for the safe storage of high value paintings and sculptures. Given the extra secrecy and protection measures associated with safe deposit boxes, this is now leading to many banks running short of those boxes and they are now offering them only to their ultra wealthy clients. There have been press reports in Switzerland that commercial banks are no longer able to meet client demand for safe deposit boxes. All of the boxes are apparently taken. As a result, people are renting safe deposit boxes in Swiss hotels. One high level source states: "...If you want a bank box in Zurich today, they will require that you have a minimum of a few million Swiss francs on deposit in the bank, before they will even consider you. That is how short of space they are!" 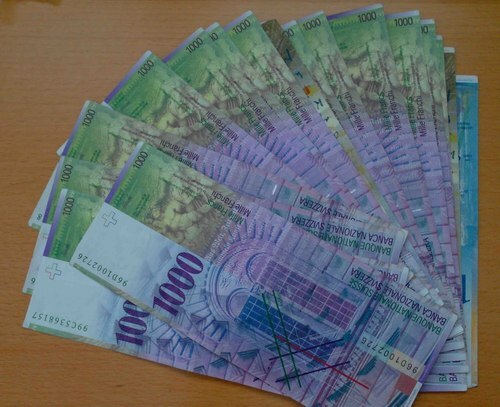 SNB has confirmed that there is a significant surge in demand for 1,000-Swiss-francs notes and admitted that this could be due to a trend to store the money and a higher demand has been noticed from abroad for those high-value currency notes. An SNB spokesperson from Zurich confirms: “We assume that the higher demand is in part due to the trend to store value in Swiss franc notes, which is a phenomenon often observed in phases of low interest rates... we further think that the higher demand is to some extent originating from abroad.” SNB did not respond to specific queries about demand from specific foreign countries and said that it does not keep any data on safe deposit boxes. While there are no official records kept or figures available for the rising proliferation of safe deposit boxes in Switzerland, the commission and fees earned by Swiss banks for such facilities appear to be rising. During 2011, Swiss banks registered a decline in their overall commission earnings, as also in their commission income from core banking operations, the SNB data show. However, their "other commissions", which includes royalty and rental fees for safe deposit boxes, rose sharply. Switzerland government’s tax department did not respond to queries about the soaring demand for safe deposit boxes in Switzerland and 1,000-Swiss-francs notes, as also about the possible use of safe deposit boxes to store illicit wealth. They also did not respond to queries about the possible use of those safe deposit boxes to circumvent the bilateral tax treaties and information exchange agreements between Switzerland and other major countries. 2. New money from Eurozone nationals -- including Spanish, Italian, French and German citizens -- who fear that their euros will lose value and have therefore kept their money in cash in Swiss francs. As a result, tens of billions of Swiss francs are gathering dust in 1,000-Swiss-francs notes held in safe deposit boxes. This money has no incentive to emerge, as interest rates in Switzerland are already negative. One is better off leaving the money in a box than in a bank account. The Swiss National Bank (SNB) has already said they won't let the Swiss franc breach 1.20 against the euro because it would make Swiss exports too expensive in euros. So if the euro becomes relatively devalued or even worthless against a basket of major currencies, what happens to the Swiss franc as a store of value? Does it not devalue in parallel with the euro per the SNB stated policy? If so, how and why does the Swiss franc continue to qualify as a safe haven as the euro loses its purchasing power step-by-step? Is there a shock waiting in store for the "New Safe Haven" investors when they discover that the Emperor-in-the-Alps has no special clothes on?